The 6005 Material – a heat sink compound formulated with select polydimethy siloxane fluid in combination with metallic oxide fillers to provide superior thermal conductivity. This product is designed for use as a heat transfer compound in both the electrical and electronic industries. 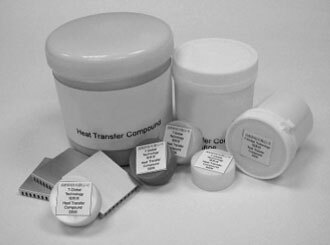 Characterized by high thermal conductivity, high dielectric constant, and high dissipation factor, the 6005 Heat Transfer Compound is an ideal product for use in power diodes, transistors, semi-conductors, and other applications that require these characteristics. The 6005 material exhibits excellent long-term storage stability without oil separation.